Ben Goldman covers the recent MC Roundtable in Streetsblog: "In this camp, America’s transportation choices are seen as a market where providers compete across the various modes for the privilege of meeting each individual’s transportation needs. A good transportation policy, in this view, is one that makes such a market function as efficiently as possible, keeping costs low for travelers and profits high enough for providers to ensure continued service without excessive government subsidy or regulation. Here, the user-pays-user-benefits principle is sacrosanct, and fiscal self-sufficiency is paramount." Former Senator Bill Bradley & former U.S. comptroller general David Walker in The Hill: "Exchange the current federal gas tax for a 6 percent oil-security fee imposed on all oil produced in, or imported into, the United States." More in the Bradley, Ridge, Walker "Road to Recovery Report." Today’s mobile technologies make it easier than ever for people to work from anywhere. These advances, combined with concerns about traffic congestion, oil's inordinate strategic importance , and the environmental impact of driving appear to create a “perfect storm” for the expansion of telecommuting. However, a few outdated legislative barriers are holding back the more widespread use of telecommuting. A well-targeted and thoughtful approach to removing these barriers can reduce congestion and the need to use oil, while providing economic benefits to businesses, individual employees, and entire regions. Click here to read a new white paper on telecommuting by Justin Horner detailing what telecommuting means today and how to remove barriers to its expansion. As the holiday driving season approaches, and at a time when national transportation infrastructure policy is up for revision and improvement, policy makers must take a fresh look at transportation. The new report “Taking the Wheel: Achieving a Competitive Transportation Sector Through Mobility Choice,” details the impact of 10 specific policies that would level the playing field among transportation options. The report’s recommendations aim to reduce the ability of an oil price spike to disrupt our economy, decrease wasteful government spending and open the door to economical and convenient transportation options. We're regularly posting items of interest right here. New Dept. 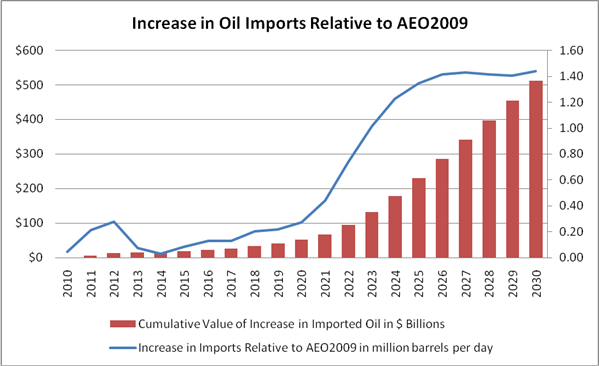 of Energy estimates project that oil imports will be about 1.4 mbd higher by 2030 than anticipated by last year’s outlook (early release of EIA's outlook is here.) Of course, fuel and mobility choice could make a big difference. Today the Mobility Choice Coalition released its Blueprint for Mobility Choice – a 10-point plan that offers a fiscally responsible, free market oriented approach to expanding competition among transportation modes for the purpose of reducing oil's strategic value. The full plan is available on the Mobility Choice web site. The Mobility Choice Coalition is a bipartisan alliance including Anne Korin and Gal Luft, co-directors of the Institute for Analysis of Global Security (IAGS); R. James Woolsey, former CIA director; Robert C. McFarlane, former National Security Advisor; Cliff May, president of the Foundation for Defense of Democracies; and Deron Lovaas of the Natural Resources Defense Council. “America’s dependence on oil not only undermines our economy, it also poses serious risks to our national security. We must act now to strip oil of its status as a strategic commodity by eliminating government regulations that stifle competition and promote inefficiencies in our transportation system,” said Anne Korin. The Blueprint for Mobility Choice lays out four guiding principles on how to move to a competitive transportation market in America. Following these principles, Mobility Choice proposes 10 transportation policies that will remove barriers to competition among transportation modes. Mobility Choice is a project of the Institute for Analysis of Global Security (IAGS) – a non-profit public educational organization focusing on energy security. Mobility Choice is dedicated to managing the national security and economic vulnerabilities posed by America’s oil dependence that stem from oil's status as a strategic commodity second to none.